Well I have been preparing for the last 2 weeks to start a mother-infant nutrition program in Peredo. There is such a need for nutritional teaching in this remote village. I did research on Breastfeeding and read the infant feeding recommendations on the World Health Organization website and spent lots of time going through various research articles on infant/child nutrition in 3rd World Countries. Finally I chose 6 women with small infants who looked like they could benefit from the program. Then I prepared them into several short lessons. Then the task of translating and practicing giving the presentations in Creole. That is the difficult part. But I learned a lot while translating them too. I felt so ready. I even made up little kits for the mothers. The kits included soap, shampoo, toilet paper, small package of baby wipes, adult vitamins for the mother, 2 cans of tuna and waterless hand sanitizer. So After church Sunday I had planned to come home and practice some more giving the presentation. But the truck broke down on the way home from church. So it took a little longer to get home (2 hours instead of the 1 hour). I was discouraged when we got home but we were having some friends over for dinner so I put on a smile and fixed baked spaghetti and garlic bread. I tried to enjoy the dinner but was worried about how I was going to get to Peredo on Monday for class. I decided I would take a tap-tap (see picture). 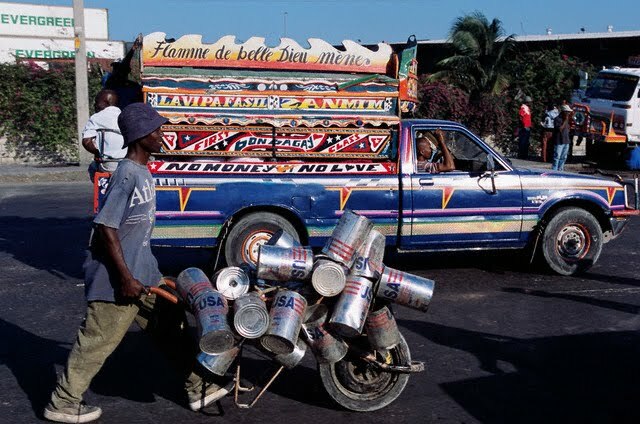 This is the public transportation in Haiti. It takes longer to get there b/c these poor trucks can't drive fast and they stop whenever a passenger "taps" on the side of the truck when they had reached their destination. 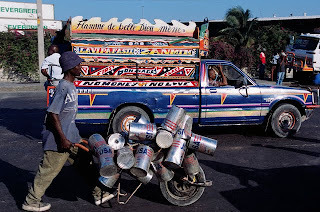 I rode a motorcycle into town to find a tap-tap going to Jacmel. I found one quickly and they insisted the "blan" (white person) sit up front with the driver. Probably a good idea for someone like me who gets carsick just looking at a curvy road. Well finally made it into Peredo and walked back to the mission church camp site from the road. The river was down but still about half way up my calf to cross to get there. Good thing I wore flip-flops! It was about 1230pm and school was letting out and the kids were walking towards e to go home. But once they saw me I had a caravan of grade school kids walking with me chattering, arguing and laughing the rest of the way. I was happy to finally arrive at the church and went inside to start getting everything ready. Class was to start at 1pm. At 1pm a lady came in with her 2 month old son and she was dripping in sweat! She had carried him all the way there. He was wrapped in a thick wool baby blanket and sleeping. I have no idea how babies in Haiti can sleep all wrapped up like that in 100 degree heat-but they do. By 1:15 PM no one else had arrived. Still no joiners at 130pm. I told the only mother, Louisana, that were would go ahead and start. She was surprised I wasn't going to wait on everyone else. I probably would have but I wasn't sure they were coming. They had all seemed so excited to be part of the program and I had even turned others away. Louisana and I talked about the importance of only giving her son breast milk for the 1st 6 months of his life. We also started talking about how she could improve her nutritional status and produce healthier milk for him. I gave her a kits of goodies and explained what each item was. We closed in prayer asking God to watch out for her son and thanking Him for sending her such a beautiful child. I was walking back out to leave and passed 2 of the mothers coming to class. They were confused as to why I was leaving. I explained to them that I told them class started at 1pm. It was now 2pm so I was leaving. Class was over. They tried to convince me to stay especially after they saw me holding a bag of goodies and do the class again with them. I knew if I did it would never break the pattern of lateness. So I told them I would be back for class next Monday at 1pm and if they weren't there I would be replacing their spots with other mothers who could come to the meetings on time. They said they would be there and they would tell the other mothers that Miss Ginny's class starts on time! I had to laugh. While walking the beach, a man saw someone in the distance leaning down, picking something up and throwing it into the sea. 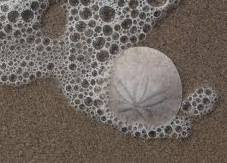 As he came closer, he saw thousands of starfish the tide had thrown onto the beach. Unable to return to the ocean during low tide, the starfish were dying. He observed a young boy picking up the starfish one by one and throwing them back into the ocean. After watching the seemingly futile effort, the observer said, "There must be thousands of starfish on this beach. It would be impossible for you to save all of them. There are simply too many. You can't possibly make a difference." The young boy smiled as he picked up another starfish and tossed it back into the ocean. "It made a difference to that one," he replied. Hopefully my preparation and effort to get to the village made a difference to Louisana and her baby boy, Gibson. We'll see how next Monday goes. Such a great work you are doing. I pray God bless you for your efforts and you see much success. It DID matter to one; I'm sure of it. Praying for you. Pasta, Toilet paper and Peanut Butter...Oh my!